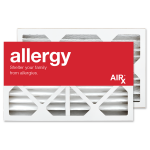 If you'd like to free yourself from particles in your indoor air which cause allergic symptoms. The unusually-sized filter probably won't be available in your local hardware store and you'll pay a premium if you purchase it throught your contractor. Buy online! We'll deliver quickly to your front door. Nominal Dimensions 12 x 20 x 4"
Actual Dimensions 12-1/8" x 20" x 4-1/4"